The best canned cat food has minimal carbohydrate content, is rich in species-appropriate animal ingredients, and comes from a company with a reputation for safety, quality, and customer satisfaction. 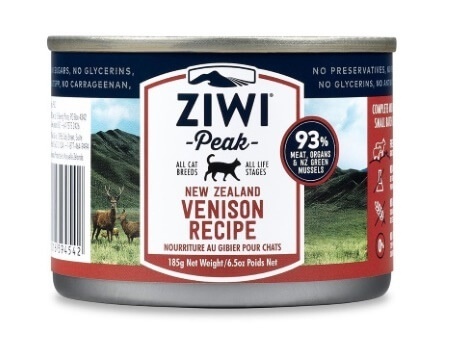 Because it’s made from high-quality animal ingredients, is low in carbohydrate content, and cats love the way it tastes, we’ve chosen Ziwi Peak as the best healthy canned or wet cat food on the market. Continue reading to learn more about our top pick and other best wet cat foods. After the list of the top 10 best healthy canned, soft, and wet cat foods, we go into greater depth on our criteria for great food. By the end of this article, you’ll have the knowledge you need to choose a great food on your own. This New Zealand company emphasizes local ingredients and is proud to claim safety and quality standards that exceed New Zealand’s stringent regulations. Nutritionally, their foods are set apart by an emphasis on high-quality meats and the absence of carbohydrate-heavy plant ingredients. All of their recipes are 98% meat, organs, and green-lipped mussels. 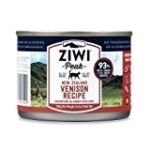 Instead of relying on plant ingredients or byproducts as a source of nutrients, Ziwi Peak recipes contain a variety of organ meats, like lung, liver, and kidney. Other interesting ingredients include fresh bone, tripe, and green-lipped mussels. They’re free from unnatural colors, chemical preservatives, and other artificial ingredients. Ziwi Peak canned foods do, however, contain a small amount of chickpeas, which aren’t species-appropriate or necessary. This venison-based recipe is one of Ziwi Peak’s most popular. It’s made primarily from venison muscle meat, broth, organs, and natural bone. 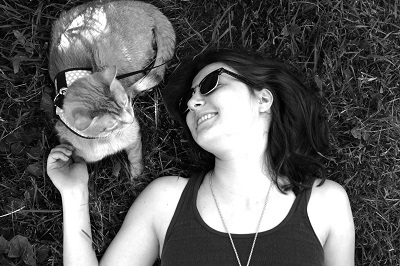 NomNomNow is a cat food meal delivery service that makes and sells fresh, human-grade food. Every week, the NomNomNow team uses restaurant-grade ingredients to craft home-cooked meals for cats. Each meal is portioned out according to your cat’s weight, age, and weight goals, then packed into a refrigerated box and shipped to your doorstep. NomNomNow foods arrive fresh, not frozen and are ready to serve right away. You’ll subscribe to a monthly or weekly plan, so you’ll never have to run out of cat food. If you like the idea of making homemade cat food but don’t feel ready for the time and effort involved, NomNomNow is a convenient alternative. 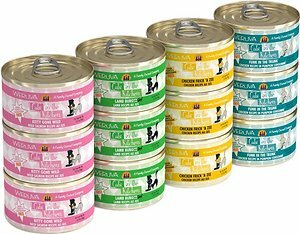 NomNomNow’s cat food line was introduced in spring of 2018 and is currently limited to chicken and fish recipes. It’s never been recalled. NomNomNow’s chicken recipe is made primarily from chicken thighs, breast, and liver, which are species-appropriate sources of protein and other nutrients. In addition to meat, the recipe contains small amounts of fruit and vegetables. On a dry matter basis, this food is about 10% calories from carbohydrate. Chicken Thighs, Chicken Breasts, Chicken Liver, Asparagus, Carrots, Spinach, Cantaloupe, Dicalcium Phosphate, Calcium Carbonate, Salt, Citric Acid (Natural Preservative), Taurine, Choline Bitartrate, Zinc Gluconate, Ferrous Sulfate, Vitamin E Supplement, Copper Gluconate, Manganese Gluconate, Thiamine Mononitrate (Vitamin B1), Selenium Yeast, Riboflavin (Vitamin B2), Vitamin B12 Supplement, Cholecalciferol (Source Of Vitamin D3), Sodium Iodide. Their foods contain nothing but meat, water, and thickening agents, along with the vitamins, minerals, and amino acids that make each meal nutritionally complete. These recipes are free of soy, grains, by-products, artificial preservatives, artificial colors, or artificial flavors. All Hound & Gatos formulas are manufactured by Performance Pet Products in South Dakota, USA. Hound & Gatos cat food has never been recalled. 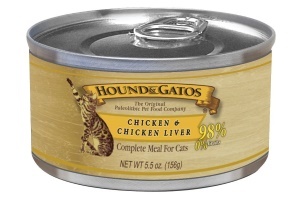 This leading Hound & Gatos recipe is made primarily from chicken, broth, and chicken liver. Like several other Hound & Gatos recipes, it contains just one animal protein, so it’s a good choice for cats with allergies and food sensitivities. 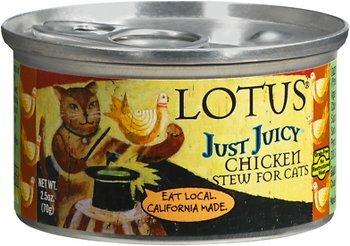 Lotus cat foods are made in the company’s own kitchen in California, USA. Their canned foods are primarily made from animal protein, sometimes with additional traces of vegetable ingredients. It’s one of the few canned cat food brands that offers a pork recipe. Lotus cat food ingredients are primarily sourced in North America, with the exception of green-lipped mussels and lamb from the seas and ranches of New Zealand. One of the few pork-based cat foods on the market, this recipe contains pork and pork broth thickened with potato starch. It also includes agar-agar, sunflower oil, and olive oil. Chicken, Chicken Broth, Potato Starch, Calcium Lactate, Chicken Fat (Preserved with Mixed Tocopherols and Citric Acid), Carrots, Monosodium Phosphate, Agar-Agar, Potassium Chloride, Salt, Taurine, Magnesium Oxide, Calcium Carbonate, Choline Chloride, Betaine, Zinc Proteinate, Iron Proteinate, Niacin, Vitamin E Supplement, Thiamine Mononitrate, Copper Proteinate, Manganese Proteinate, Sodium Selenite, Calcium Pantothenate, Vitamin A Supplement, Riboflavin, Pyridoxine Hydrochloride, Biotin, Vitamin B12 Supplement, Calcium Iodate, Vitamin D3 Supplement, Folic Acid. One of the great things about Weruva food is that when you open up a can or pouch of it, you see real meat—shredded chicken, chunks of fish, and other good-enough-to-eat ingredients. The brand offers simple recipes with just a few minimally-processed ingredients. This brand might be near the top of the list if it weren’t for a couple of problems. The first issue is that this brand doesn’t give you much for your money. 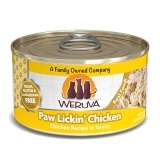 Weruva cat food is extremely water-dense, so it has fewer calories per can or pouch than other foods. If you want to keep your cat ultra-hydrated, you can always add water on your own. Concerningly, a Weruva brand was recently involved in a serious recall. In 2017, cans of B.F.F (Best Feline Friend) cat food were deficient in thiamine, killing dozens of Australian cats. The incident was limited to products sold in Australia and made by a single manufacturing partner. This chicken-based recipe consists of shredded chicken in a broth thickened with locust bean gum, xanthan gum, and guar gum. These gums aren’t a necessary part of the feline diet, but there’s little indication that they’re harmful. 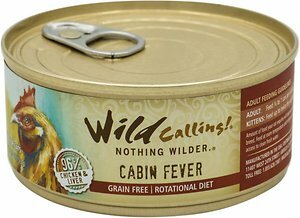 Wild Calling sells grain-free canned cat food made primarily from single animal proteins, including chicken, duck, salmon, and beef. They fit well into a rotational diet and are appropriate for cats with food sensitivities and allergies. All of their canned recipes consist of 96% meat and liver, leaving little room for plant ingredients. They’re low in carbohydrates, and because they’re primarily made from meat and not particularly watery are quite calorie dense. This can be a good thing if you want to feed your cat less and give them an efficient diet but may be a problem if your cat needs to lose weight. These recipes are free from artificial ingredients, like colors, flavors, and preservatives. Wild Calling foods have never been recalled. This thick pate food is made primarily from chicken meat and liver. It’s thickened with guar gum, cassia gum, and xanthan gum. Although pate-style foods are typically more species-appropriate and have lower carbohydrate content than stew-style products, a few companies create stews without starches and thickeners. 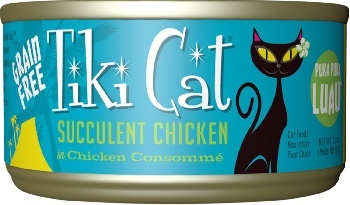 Tiki Cat is one of those companies. Their large canned food selection focuses on products made from meat, oil, and vitamins and minerals. The foods are made without any artificial colors, flavors, or preservatives. Their foods are manufactured in Thailand, a country known for excellent food production and safety standards. Tiki Cat has never been recalled. This recipe is strikingly simple—it’s a can of fortified shredded chicken in broth and oil. The recipe consists of chicken, broth, oil, and supplements. Nature’s Variety is a US-based pet food company. 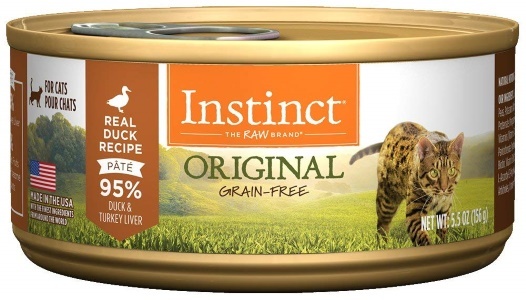 Instinct is their grain-free pet food line. Their foods are marketed as natural and species-appropriate, but their recipes are some of the fluffier ones you’ll see on this list. Their canned foods are heavy on meat ingredients like chicken, turkey, and chicken liver, but also contain gimmicky plant ingredients like ground flaxseed, peas, and carrots. Nature’s Variety pet food was recalled in 2015, 2013, and 2010. Salmonella contamination was involved in two of these recalls, while the 2013 recall happened after people found clear plastic in the food. This popular pate recipe consists of 95% chicken, turkey, and chicken liver. The remaining five percent is dedicated to fruits, veggies, montmorillonite clay, vitamins, and amino acids. The Wellness brand is made and manufactured by WellPet, LLC., a company that began as the Old Mother Hubbard company, which introduced its first oven-baked dog biscuits back in 1926. Today, Wellness is a big brand with numerous lines of dog and cat food. The CORE line is the grain-free facet of the Wellness business. Their recipes are made without grains, plant protein, or artificial ingredients. They’re available in both flaked and pate varieties. Wellness foods are more economical than the others on the list. 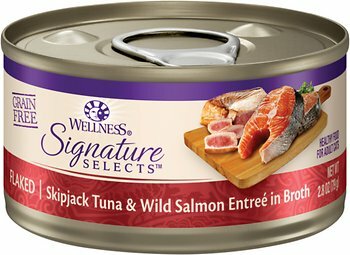 Wellness pet foods have been recalled several times. Wellness was recalled twice in 2017, once in 2012, and another time in 2011. The 2011 recall is the only one that involved the CORE line. In February of that year, the company recalled a staggering 21.6 million cans of Wellness cat food due to inadequate levels of thiamine. 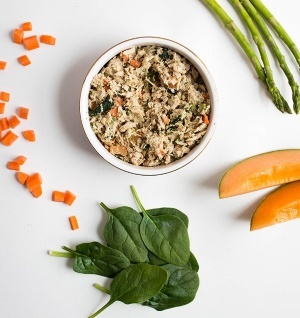 Fish-based recipes aren’t the best choice for cats, but this fishy formula is one of Wellness CORE’s most popular recipes. It contains flaked tuna, mackerel, and salmon in a thickened broth. This brand is part of FirstMate Pet Foods, a company that manufactures simple grain-free canned foods in their own British Columbia facility. 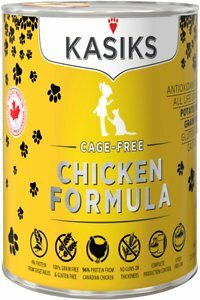 Kasiks foods emphasize animal protein and are highly-digestible due to the absence of plant protein fillers, fruits and vegetables, and other ingredients cats don’t need. Canadian customers can purchase the company’s forward-thinking Fraser Valley Grub Formula, which is made from fly larvae and wild coho salmon. Insect protein is arguably one of the most sustainable, nourishing, and under-utilized options for cat food. Neither Kasiks nor its parent company, First Mate, have ever been recalled. This pate recipe centers around boneless chicken. It’s thickened with pea starch and contains traces of blueberries, raspberries, cranberries, and coconut. Boneless Chicken, Water Sufficient For Processing, Pea Starch, Sodium Chloride, Calcium Carbonate, Dicalcium Phosphate, Potassium Chloride, Choline Chloride, Taurine, Kale, Minerals: (Zinc Proteinate, Iron Proteinate, Copper Proteinate, Manganese Proteinate, Calcium Iodate) Vitamins: (Vitamin E Supplement, Niacin, Vitamin A Supplement, Thiamine Mononitrate, Riboflavin, Biotin, Vitamin B12 Supplement, D-Pantothenic Acid, Folic Acid, Vitamin D3 Supplement) Blueberries, Raspberries, Cranberries Coconut. While the Dr. Elsey’s brand is a veteran in the cat litter space, it’s new to cat food. The company’s cleanprotein™ line was introduced in 2017. It includes a high-protein dry kibble and a selection of canned products. The products in Dr. Elsey’s cleanprotein line emphasize meat ingredients. Ingredients like chicken, turkey, broth, liver, and dried egg product lead the pack, while plant ingredients take a definite backseat. You won’t find any low-value proteins in any cleanprotein foods, and the company goes light on plant ingredients in general. The foods are grain-free with minimal carbohydrate content. 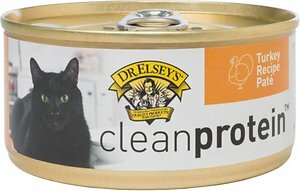 Dr. Elsey’s cleanprotein cat food has never been recalled. This simple recipe contains turkey, broth, liver, and dried egg product. It’s thickened with agar-agar and supplemented with green-lipped mussels as a source of glucosamine and chondroitin. The food also contains barley grass and turmeric in addition to the standard supplements. Turkey, Turkey Broth, Turkey Liver, Dried Egg Product, Natural Flavor, Potassium Chloride, Agar-Agar, Barley Grass, Choline Chloride, Salt, Taurine, Salmon Oil, Turmeric, Dried New Zealand Green Mussels, Zinc Proteinate, Iron Proteinate, Magnesium Proteinate, Niacin Supplement, Vitamin E Supplement, Copper Proteinate, Sodium Selenite, Thiamine Mononitrate, Manganese Proteinate, Vitamin A Supplement, Calcium Pantothenate, Riboflavin Supplement, Pyridoxine Hydrochloride, Biotin, Vitamin D3 Supplement, Vitamin B12 Supplement, Ethylenediamine Dihydroiodide, Folic Acid. What should you look for when shopping for wet or canned cat food? Buy from companies with a reputation for quality control, safety, reliability, and good customer service. Use your own judgment to evaluate the circumstances of and response to any given recall. A company with a history of constant recalls, deception, and secrecy is not one you can trust. There’s no need to dismiss a company based on a single minor recall, provided that they responded to it swiftly, honestly, and effectively. If your cat gets sick after eating their food or if you have questions about something on the label, you’re going to want to talk to someone at the company. Before committing to a cat food company, determine if they’ll be a friendly, accessible ally in your cat’s health. While this information is sometimes proprietary, it’s good to find out where your cat’s food is manufactured. Many companies, if not most, partner with manufacturers rather than making the cat food in their own facility. Knowing where your cat’s food is made will help you to assess its quality. Check out our complete guide to the best cat brands food. While wet food is more meat-dense than dry kibble, carbohydrate-laden canned food does exist, particularly among “premium” brands. Wholesome fruits and veggies play into an anthropomorphic idea of feline health. In reality, cats don’t require high-carbohydrate ingredients like sweet potato, spinach, carrot, and other ingredients sometimes included in canned food. Avoid these ingredients whenever possible. Click here to read our guide to the best and high protein low carb cat foods. Cat food labels list crude protein and fat only. They don’t differentiate from bioavailable protein and indigestible protein. When you read the label, 20% protein from leather and 20% protein from turkey appear as exactly the same thing. So while a given food may boast about its high protein content, it’s important to take a look at the ingredient list to determine where that protein is coming from. The problem with by-products is not the fact that they “look gross”. In fact, disgusting foods are some of the best nourishment for cats. A mouse brain isn’t appetizing, but it’s one of the best things your cat could eat. The real issue is that meat by-products are completely opaque ingredients. They’re mystery meat, and for your cat, that means unknown biological value. Meat by-products are a nondescript slurry of meat and include animal parts spanning the bioavailability spectrum. Byproducts could be nourishing or you could get a can of meat byproducts consisting of non-nutritive feet and other minimally-digestible tissues. To avoid this nutritional ambiguity, choose foods with clearly-identified meats on the ingredient list. Look for words like “chicken”, “beef”, “deboned turkey”, and “quail liver”. In order to thicken the gravy used in these types of cat food, cat food manufacturers typically include starches. Therefore, paté is preferable to anything set in gravy. Want to learn more about choosing healthy food for your cat? Check out our complete guide to the best cat food on the market. guide to the best cat food on the market. question, first of all, thank you for this site and research Mallory. my question is, if after you have fed your cat a certain kind of pate for weeks, then your cat vomits once, does that mean your cat is now intolerant of THAT particular kind of food? my wife switches can food every time our cat vomits and it make me question it. Thanks for your question! Vomiting once after weeks of feeding doesn’t necessarily indicate an intolerance. If you really want to get to the bottom of this, I’d recommend trying an elimination diet and carefully reintroducing proteins to determine which, if any, protein sources trigger GI issues. Otherwise, you’re switching foods willy-nilly and, even if your cat does have a food intolerance or allergy, you don’t know exactly which ingredients he or she is sensitive to. FYI – Bravo does not appear to be selling canned cat food anymore. Just raw kibbles. The cat I feed and provide a safe place for her to sleep outdoors is a feral Her ear is clipped, which means she is fixed and had shots, hopefully. She loves Meow Mix singles, which I hate due to bad ingredients. I am sure she eats mice, birds and insects, so I want to feed her a better wet cat food and not Pate, which she hates. She loves chicken. What could you suggest? Note: I can’t afford the high price brands.